BF and the number of complete cycles must be specified for 50% power demand. This value can be between 1 and 255 complete cycles, determining the speed of firing. When 1 is specified, the firing mode becomes Single Cycle (SC). It is an electronic device that limits the current absorbed by the load. It is necessary in some application where the load current in some conditions can go beyond the nominal current value. Example: with heating elements Kanthal Super during the starting phase the load has a value similar to zero therefore it is necessary to limit the current. Read More: SCR Power Controller with current limit . A current transformer is an electric device that produces an alternating current (AC) in its secondary which is proportional to the AC in its primary. 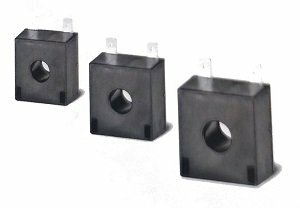 Current transformers are used in electronic equipment and are widely used for metering and protective relays in the electrical power industry. Used to switch the primary coil of transformers when coupled with normal resistive loads (not cold resistance) on the secondary, DT prevents the inrush current when zero voltage (ON-OFF) is used to switch the primary. The thyristor unit switches OFF when the load voltage is negative and switches ON only when positive with a pre-set delay for the first half cycle. Supply voltage fluctuations changes the power to the load. To overcome this effect the voltage supplied to the load is measured and compared with the power demand from the controller. The error signal is used to automatically hold the power at the value requested. • Voltage Control Mode, where the input signal is proportional to the voltage output (voltage f/b). • Current Control Mode, where the input signal is proportional to the current output (current f/b).Power Control Mode, where the input signal is proportional to the power output (power f/b). • As an option it is possible to transfer control mode from voltage to power via a simple digital command. The Heater break alarm function detects the AC current flowing through the heater by a Current Transformer (CT) and compares the CT input value and heater break alarm set value. PA controls the power to the load by allowing the thyristor to conduct for part of the AC supply cycle only. The more power required, the more the conduction angle is advanced until virtually the whole cycle is conducting for 100% power. The load power can be adjusted from 0 to 100% as a function of the analogue input signal, normally determined by a temperature controller or potentiometer, PA is normally used with inductive loads. SC is the fastest zero crossing switching method. At 50% input signal, one cycle is ON and one cycle is OFF. At 75%, 3 cycles are ON and one cycle is OFF. If power demand is 76% the unit performs the same as for 75% but every time the unit switches ON the microprocessor divides 76/75 and memorises the ratio. When the sum is one the unit delivers one cycle more to the load. With this firing it is necessary to have analogue input. This is an additional feature to Burst Firing. Starting in Phase Angle mode, the unit ramps from zero to full voltage at a preset time, finishing at full conduction for remainder of the ON period. Idealy used to switch small inductive loads, S+BF avoids current surge and minimizes electrical interference. Thyristor unit is a semiconductor device which acts as a switch formed by two thyristors in antiparallel. To form a real switch for alternating current is necessary to use two thyristor in antiparallel. Remember that thyristor does not work with d.c. voltage power supplyThe thyristor that is in conduction does not stop to conduct up to when the voltage go to zero. This also if we remove the gate signal after to have switch ON it. ZC firing mode is used with the logic output from a temperature controller and so the thyristor operates like a contactor. The cycle time is performed by the temperature controller. 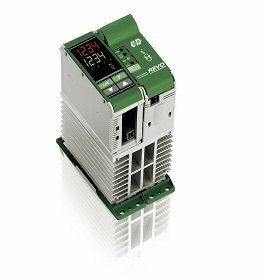 Zero Crossing minimizes interferences as the thyristor unit switches ON-OFF at zero voltage.